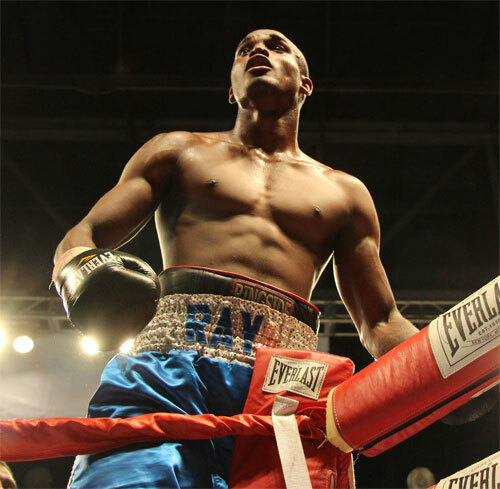 Ray Robinson scored an impressive seventh round TKO of tough Ray Narh to win the vacant USBA welterweight title Friday night at the Bob Carpenter Center in Newark, DE. Robinson used his southpaw style to gain an early edge in the scheduled 12-rounder, but did not fully find his groove until round six. Urged on by new trainer Bozy Ennis, Robinson found the perfect distance and timing against the dangerous Narh, who had upset Ronald Cruz in his last outing. Robinson worked like a safe-cracker to find the proper combination in the fight, and found it on the inside. Robinson repeatedly jabbed his way in, fired to the body and then struck with a jarring uppercut. The combination started paying dividends right away, and by the following round brought the fight to a close. Robinson dropped Narh with an uppercut midway through the seventh round, and then put him through the ropes a few moments later. Narh got up from both knockdowns, but by this time Robinson was on a roll. 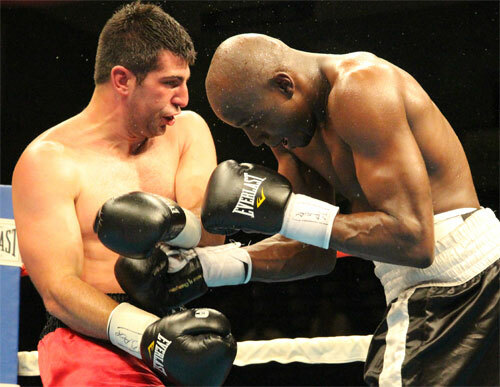 After the second knockdown, he battered Narh until referee Malik Waleed stepped to stop it. The time was 2:33. The win was an excellent one for Robinson, 16-2, 7 KOs, who continues to improve each time out. 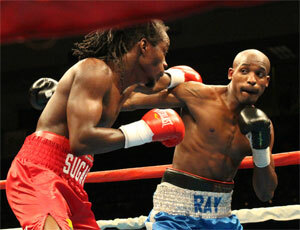 This was his fifth straight victory and another surprise KO, like his demolition of Terence Cauthen last year. The quality of this victory by Robinson is reinforced by the fact that Ray Narh, 26-3, 21 KOs, is such an excellent and tough competitor. In June he returned with that fine win over Cruz to prove that he was still a factor, but against Robinson he could not get his fight going. Robinson looked big, strong, and patient, as he rumbled and took risks against Narh until he found the key. It was a great win. 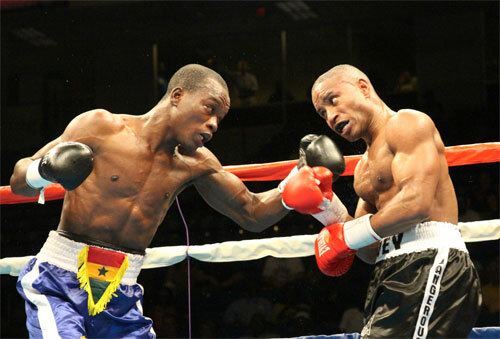 In the 10-round semi-windup, Ghana's Samuel Kotey Neequaye (above in blue trunks) remained undefeated, 21-0, 16 KOs, with a unanimous decision victory over Dorin Spivey to win the NABA lightweight title. 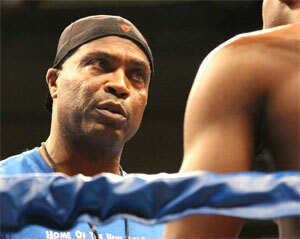 Spivey was the aggressor in the fight, and appeared to be controlling much of the action. But Neequaye was deceiving with his straight-up, stiff-legged style. He wasn't impressive until he let his hands go. The African's punches were heavy and Spivey felt the power, and that was the difference in the fight. The two mixed it up in a good action fight. In round five, the fighters tangled legs and Spivey went sprawling to the canvas. Referee Vic de Wysocki called it a knockdown, but really was more of a slip. All three judges returned a comfortable decision for Neequaye (97-92, 96-93 & 98-91). 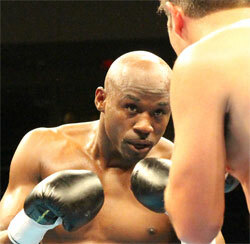 Spivey dropped to 42-7, 30 KOs, but fought an exciting battle. 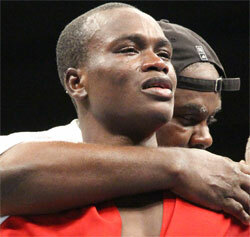 The win gave tearfully happy Neequaye the NABA 135-pound title. The four preliminary bouts started with a scheduled 6-round junior lightweight bout between Andrew Farmer of Front Royal, VA (above) and Hector Marengo of Puerto Rico. Marengo jumped out to an early lead, but Farmer fought his way into the fight. By the second half, the Virginian was in control. His caused was helped in the final round when referee Vic de Wysocki credited Farmer with a knockdown after a mild left to the arm and a tangle of feet deposited Marengo on the canvas. If it was a knockdown, it wasn't a violent one. Judge Dave Braslow scored the fight for Marengo, 57-56, however judges Brian Costello and Mark D'Attilio over ruled with their 58-55 scores for Farmer. The split decision win raised Farmer's record to 17-2, 7 KOs. Marengo fell to 5-5-4, 3 KOs. 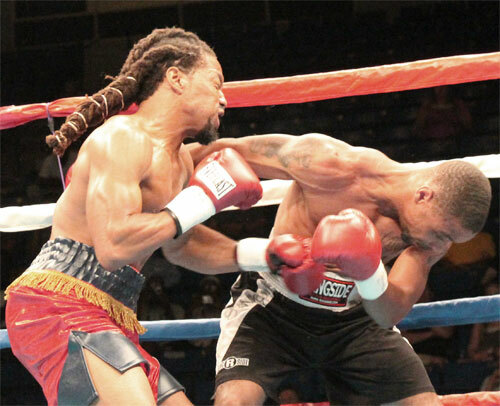 Junior lightweight Omar Douglas of Wilmington (above in red trunks), thrashed a game DeWayne Wisdom, who was a last-second substitute opponent. Wisdom came from Indianapolis on the day of the fight, and was overmatched as soon as the bell rang. In round two, Douglas hurt Wisdom with a body blow that made him take a knee. He seemed ready to quit, but bravely rose and went back for more punishment. 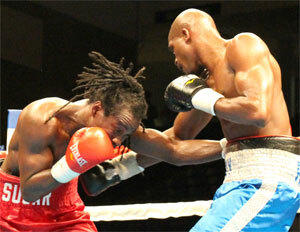 In round three, more battering put Wisdom on the canvas twice more. The first time was another self-imposed respite. The second knockdown in the round came courtesy of a ripping left hook to the body by Douglas. Referee Malik Waleed finally stopped the fight at 2:24 of the third, but could have ended matters on several occasions earlier. 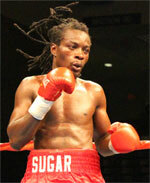 Douglas remained undefeated, 9-0, 7 KOs, while Wisdom dropped to 3-12, 1 KO. 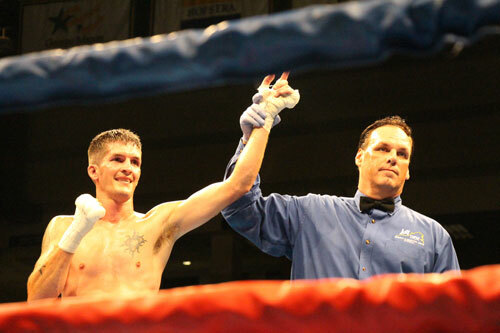 Joey Tiberi won a 4-round majority decision over Miguel Antonio Rodriguez in their lightweight bout. I felt that Rodriguez had done enough to win the fight, but to be fair, much of the action was closely contested and could have gone either way. The best part of the fight was the toe-to-toe finish put on by both boxers, apparently aware of how important the final three minutes would be on the scorecards. Judge Dave Braslow called the fight a draw at 38-38, but D'Attilio and Costello both tallied 39-37 for Tiberi to give the local fighter the win. 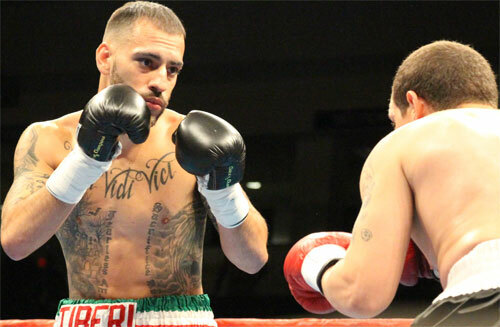 Tiberi improved to 10-1, 5 KOs. Rodriguez went home 1-6. In a bruising light heavyweight bout, Philly's Taneal Goyco (above in black trunks) shocked Norfolk, VA's Frankie Filippone by squeaking out a majority decision over six rounds. Filippone hurt Goyco in the first, but the Philadelphian hung in there and kept fighting. Goyco rallied down the stretch to gain the edge on the official cards. His best round was the ninth, body work (some of it low) tired Filippone. A round later, the last, Goyco suffered a cut over his left eye, but it did not affect the fight at all. Once again, Dave Braslow was on his own with his 57-57 even score, while the scores of D'Attilio and Costello determined the outcome. Both judges had it 58-56 for Goyco. It was Goyco's first win since 2011 and raised his record to 5-6-1, 2 KOs. Filippone, 14-3-1, 2 KOs, lost for the first time since 2010. The fight was promoted by Champs Management, a cartel of businessmen headed by former middleweight Dave Tiberi. The show drew a crowd of about 700 to the University of Delaware campus.